Fast paced dice game where everyone races to roll their 6 dice until they get the numbers that complete the challenge on the card, i.e. all # 3's or total of the colored dice is less than the total of the white dice. Then they must be the first to grab the squishy "Steven"� doll to win the round. 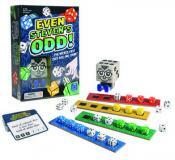 For 2-4 players, game comes with 24 dice, 40--2 level challenge cards and 4 dice holder. Helps improve visual scanning and processing, memory and critical thinking while also working to develop the arches of the hand as dice are cupped in the hands.